When a loved one suddenly and unexpectedly passes because another person carelessly or recklessly causes his or her death, it is natural to want justice. For many individuals who (unfortunately) find themselves in this situation, justice involves the alleged wrongdoer admitting his or her role in causing the person’s death and/or paying a large sum of money as compensation for the financial challenges, losses, and emotional trauma the person’s passing caused. For these individuals, the thought of settling their wrongful death cases with the at-fault person is inconceivable. However, in some situations, settling a wrongful death suit may make the most sense. 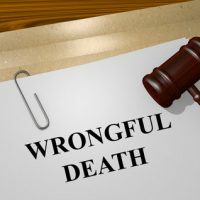 Why Settle a Wrongful Death Suit? In a wrongful death lawsuit, the surviving family members of a decedent seek compensation from the individual or party whose negligent conduct caused the decedent’s death. The monetary damages available to wrongful death claimants may include compensation for funeral expenses, loss of the decedent’s love, support, and presence, and mental pain and suffering experienced by the survivors. Settlement agreements are not uncommon in personal injury cases and wrongful death lawsuits. A settlement agreement is a mutually-agreeable resolution reached by both parties that settles or resolves the claims of the wrongful death suit. In many such settlements, the allegedly at-fault party agrees to pay a certain sum of money to the wrongful death plaintiffs in exchange for not having to admit responsibility for killing the decedent. Certainty and finality: In any personal injury or wrongful death suit, recovering any amount of compensation at all is never guaranteed. Even where the plaintiffs prevail at trial, the at-fault party can usually appeal the trial court’s decision to an appellate court. In contrast, a settlement agreement can almost never be rescinded and guarantees the plaintiffs will recover some amount of compensation. Speed: A wrongful death lawsuit may last for months or even years. In the interim, while the case is pending the plaintiffs will often need to find ways to address their financial losses themselves. A settlement agreement can resolve the suit much more swiftly and can, in turn, result in the plaintiff or plaintiffs receiving compensation more quickly. Fewer expenses: Not only may plaintiffs be able to receive compensation more quickly, but resolving a wrongful death claim sooner usually also means that the plaintiffs will pay less in expenses related to litigation. Do not settle your Florida wrongful death lawsuit without speaking first with a knowledgeable Clearwater personal injury attorney from Roman & Roman. We will review the unique facts and circumstances of your case and advise you whether pursuing a settlement is advisable for you and your family. Contact Roman & Roman by calling (877) 767-1032 today, or contact the firm online right away and allow us to help you make the best choices possible for your family’s wellbeing and security in the aftermath of a wrongful death incident.